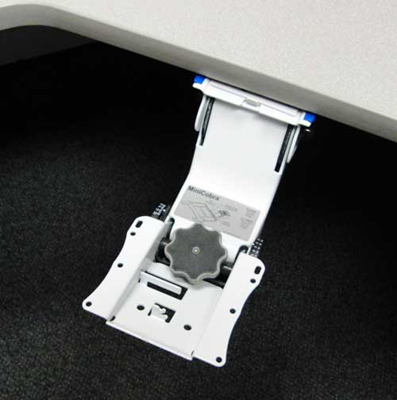 The Mini Cobra keyboard arm is ideal for above desk adjustment and medical cart applications. Height adjusts without knobs or levers. 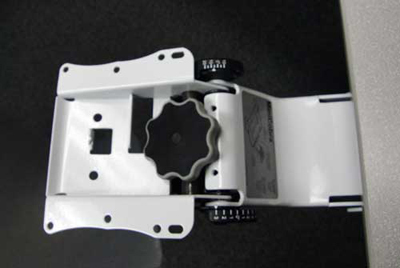 Our Dial a Tilt capability allow the user to simply move the keyboard tray to the desired position and release. Optional positive tilt lock-out feature can be factory supplied or field installed. Counterbalance design offsets keyboard weight during height and tilt adjustment. 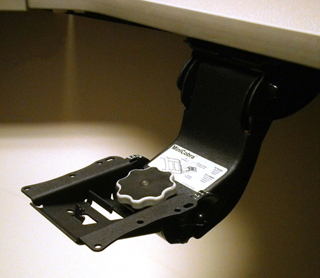 Slim profile provides maximum knee clearance, whether in use or retracted for storage. Rear swivel rotates 360° for optimal keyboard tray positioning and easy storage. Closed-channel design provides maximum keyboard stability. – Soft-touch wheel adjusts tilt (+10°/-20°). – Counterbalance spring helps offset keyboard weight during height adjustments. – 8" total height adjustment range(3" above; 5" below the work surface). – No knob, lever, or ratchet handle required to set height; simply lift to desired position and release. – Rugged steel construction finished in a durable black. White or silver textured powder coat available upon request. – Meets or Exceeds ANSI / BIFMA Industry Standard. – All mounting hardware and instructions included.